L to R: Back row: Dr. Brian Luck, Derek Ducat, Ray Liska, Bill Smith, Chuck Rabitz. Front Row: Josh Bartholomew, Bill Arneson, Bryce O’Leary, Maria Woldt. Not pictured: Dr. Kevin Shinners, Dr. Matt Digman. Jesse Dvorachek from Dvorachek Farm and Industry, LLC in Brillion, was elected as an operator director. Isaac Lemmenes from Braun Electric, Inc. in St. Nazianz was elected as a corporate director and as the group’s treasurer. Dvorachek is the owner of Dvorachek Farm and Industry, LLC, a custom manure application company. 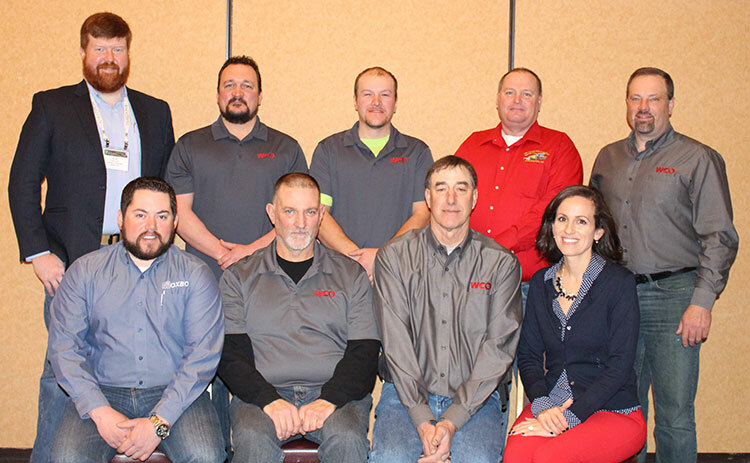 In addition to WCO, Dvorachek is a member of the Professional Nutrient Applicators Association of Wisconsin (PNAAW) and Peninsula Pride Farms, a farmer-led group that focuses on promoting environmentally sound agriculture on the Door Peninsula. Dvorachek and his wife, Heather, have three children: Sage (7), Bella (5) and Wyatt (2). Lemmenes serves as the manufacturing shop supervisor, product designer and as a manure equipment sales rep for Braun Electric, Inc., a diverse farm service business that offers ventilation, excavation, dredging and manure services, fabrication, sales, rental equipment and more. Lemmenes, who also has experience as a custom manure applicator, previously served on the WCO board as an operator director from 2014 to 2017. Officers were also selected by the WCO board of directors. Bryce O’Leary, owner of O’Leary Brothers Chopping Service LLC in Janesville, was re-elected as the group’s president. Ray Liska, owner of Apollo Vale Enterprises in Cochrane, was re-elected as vice-president. Corporate representative Josh Bartholomew of Oxbo International in Clear Lake was re-elected as secretary, and Lemmenes was elected treasurer. Retiring board members Bill Arneson of Arneson Custom Farming in Barneveld and Chuck Rabitz of Peshtigo National Bank in Coleman were honored for their service to WCO.